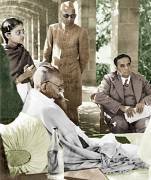 Mahatma Gandhi at Birla House, New Delhi, January 13, 1948. Mahatma Gandhi in the garden of Birla House, New Delhi, January 13, 1948. 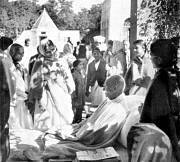 Mahatma Gandhi at Birla House, during his fast for communal peace in India, Delhi, January 17, 1948. Mahatma Gandhi reading prayers at the end of his last fast at Birla House, Delhi, January 18, 1948.